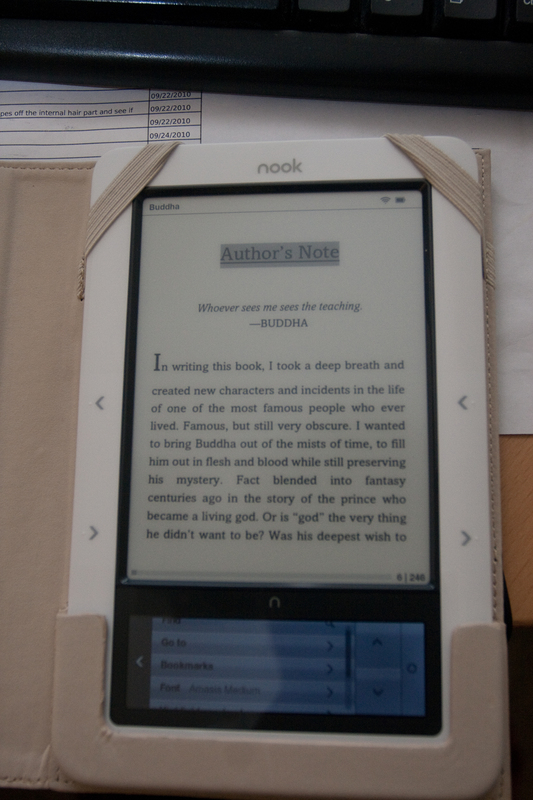 As you may remember, a few months ago I decided to rethink the issue of ebooks. 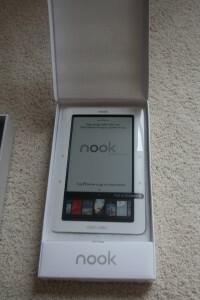 I was going back and forth about buying the Barnes and Noble Nook just before my recent flight to Florida. I had been looking forward to the flight as a chance to read through some of Cory Doctorow’s fiction. 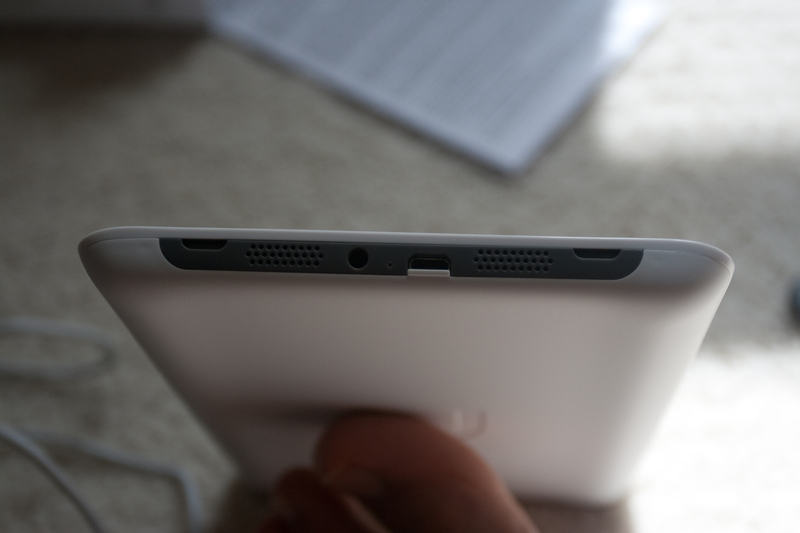 In the end, I decided I didn’t want to spend the money on the device and read it on my laptop. This was less than ideal. The laptop only had about 20 minutes of charge on the battery and so I had to split up reading the book between the outbound and inbound trips. 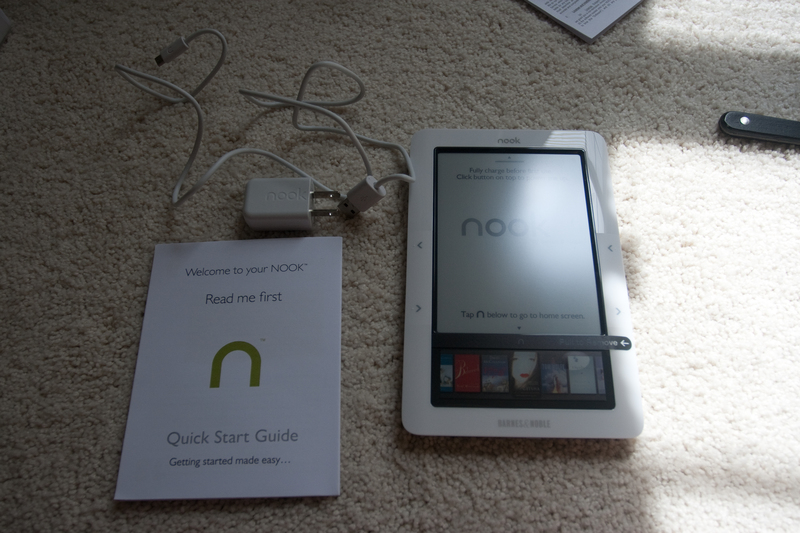 Sometime in the near future Danielle and I are going to be taking a much longer flight, so I caved and decided to buy the nook. 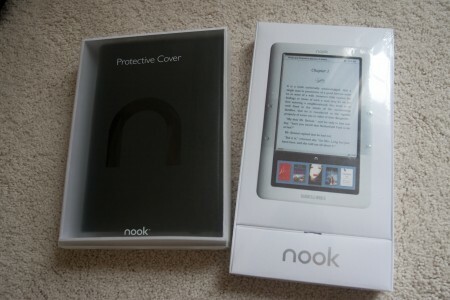 When I went to buy it at Barnes and Noble, I saw they had a HUGE kiosk in the front of the story to sell the device. Luckily for the woman there, I had already done tons of research, so I just wanted to grab one and go. While waiting for her to finish up with another customer so she could get my device, I did hear that most publishers had enabled a feature that allowed you to read any book on your nook for 1 hour free (only one time) while in the store. Pretty good for their coffee bar and pretty good for getting you into the store. 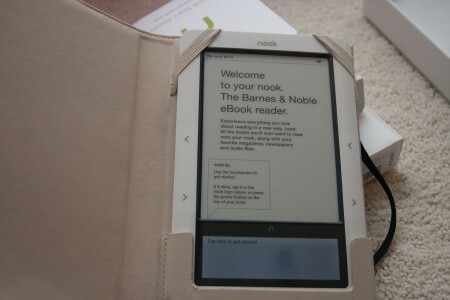 I was astonished at how small the nook is! That’s something that the web is just not good at – giving a sense of scale. I knew I was getting the right device. I debated what cover to get for it. I really liked the one with the ampersand on front, but it lacked the band to keep the cover closed if it was stored in a bag. I got it home and opened it up. And it asked me to setup wifi right away. It quickly found my access point. I entered my password with the touchpad keyboard and it conncected! And I use WPA2! It wasn’t clear what to do next, so I clicked on the left arrow until it asked me to register. So I did. There was a noticeable lag as I typed, but this is a book reader, not a word processor. Once it was registered it let me know the user’s guide was in the library. Then it was time to set the clock. Or at least, I thought it was, but when I hit ok it told me to take a quick tour. Sure, why not? Interestingly, I learned that going to the main menu clears the screen although it’s just a button press away to get back to what you were reading. I also learn it plays OGGs. Yay! My tour over, I decide to see if Chopra’s book on Buddha (which I’d bought earlier today – it was free as Friday’s incentive) has been loaded into my nook and, if not, how to load it in. I see a bunch of books, but most of those must be preloaded samples. Ah, these are just ads, in a way. So i click on “Check for new B&N Content”. That doesn’t appear to bring in the Buddha book. Hmm… Eventually I figure out that I load up the book and, where it had the press release, I need to click download. It hasn’t been downloaded yet. It downloads in something like 30 seconds. When the book is loaded, I just can’t believe how crisp and clear the text is. In most of the books I’ve ever owned, there’s a slight smudging to the text – smudging isn’t totally correct that makes it sound worse than it is. But there have often been slight typographical errors. None of that is on display here. It’s a nice, crisp font. OK. So far so good. 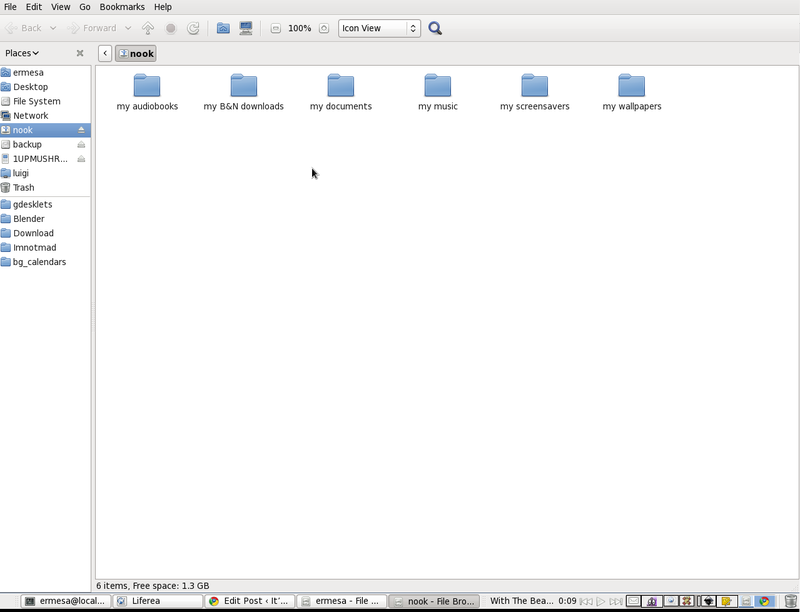 Now let’s load up some Cory Doctorow novels and see how well those work as well as how it integrates with my library. 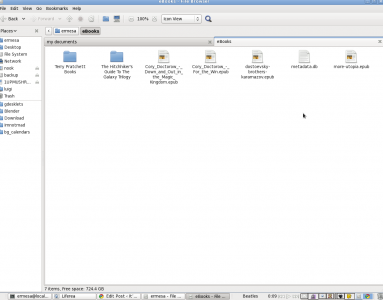 I get the impression that it’s probably going to load on my computer as a USB mass storage device so I decide to connect it to my Linux computer since that’s where I have my ebooks. And, as you can see in the screenshot, that’s exactly what happens! Yay! 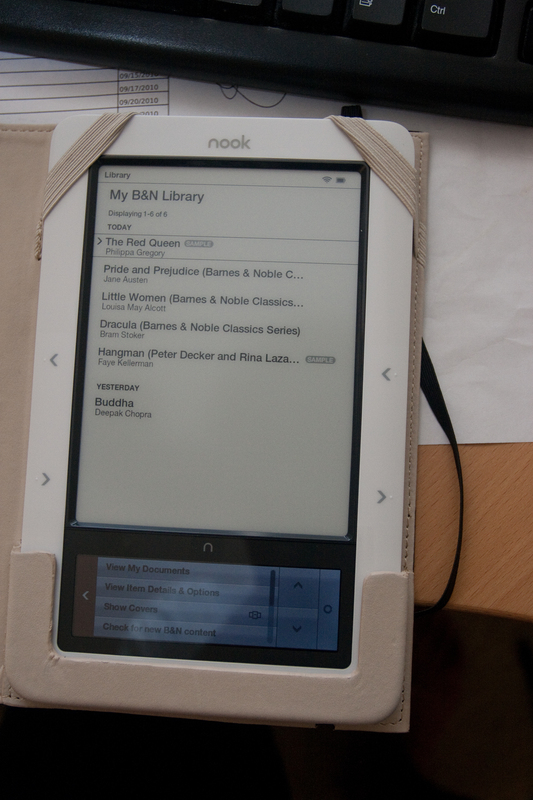 So here are the ebooks I’m going to put in there – there being the “my documents” folder of my nook. Then I unmount the nook. So it they don’t show up under “My B&N Library”, but they definitely show up under “My Documents”. Very nice. It all works very well, and I’m quite happy. I guess it’s time to get some more Cory Doctorow books. I wish I could see book covers for these non-B&N books! The covers show up when you’re reading the book (if your alternative site files have the cover built in) but you can’t use the cover flow to select a book. So, I’m really loving the nook so far. 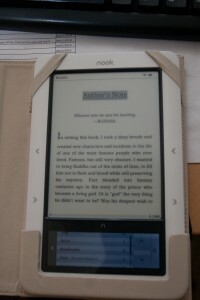 I love that it supports listening to music loaded on there while you read. Just a couple niggles. 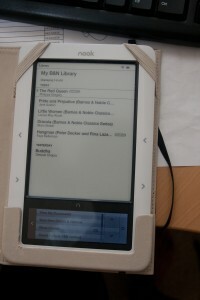 I keep wanting to click on the e-ink screen. If only it were touch screen. 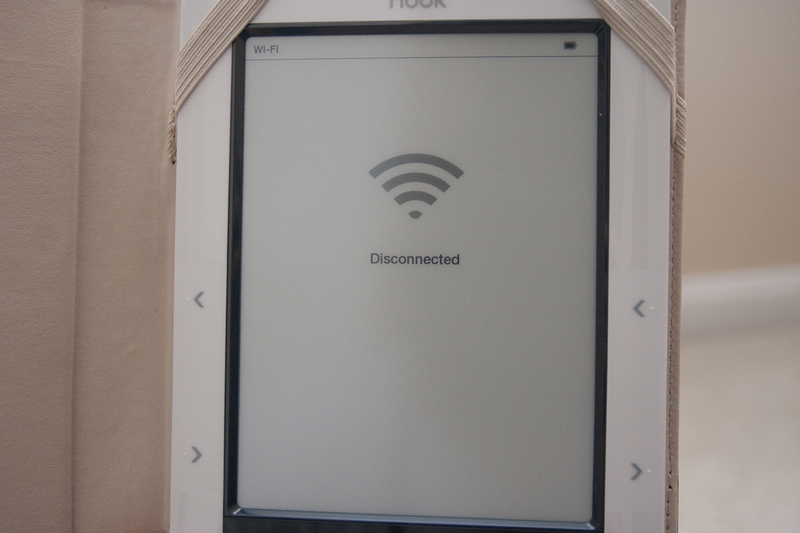 Also, the effect of the e-ink changing pages is a little jarring. It’s not the end of the world, but it’s a little abrupt in a way that turning physical pages isn’t. After reading with it last night in bed, I think it’s perfect for bedtime reading – especially for new books. My wife was struggling with the weight of the hardcover edition of the last book from The Millennium Trilogy while the nook is about as light as any trade paperback book – with about the same form factor. I re-read The Colour of Magic by Terry Pratchett and it was a pleasant experience. I had used calibre to convert a PDF version of the book into ePub and there were just a few little typographical glitches, but that’s the conversion’s fault. 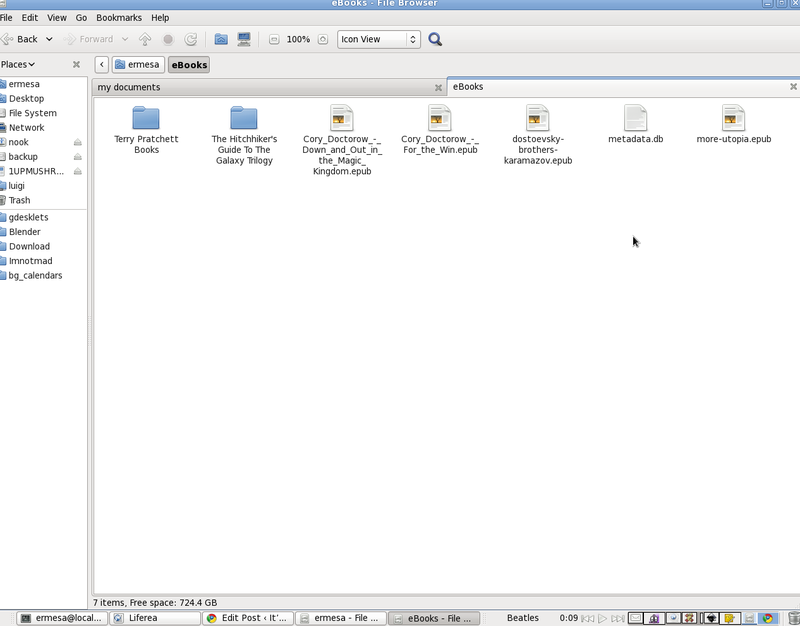 I downloaded the rest of Cory Doctorow’s books and loaded those onto my device as well. It’s a cakewalk with Calibre – just click “send to device”. Other little details: I still haven’t set the time. You’re best off putting the Nook to sleep instead of turning it off. From what I understand, it consumes next to no electricity while asleep and it takes a while to book up. 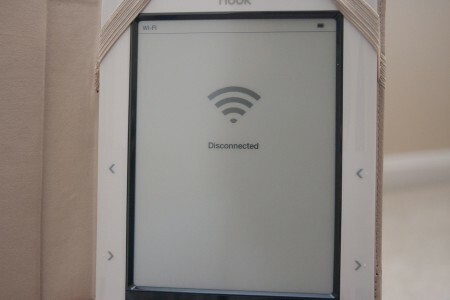 It doesn’t take FOREVER to boot up, but it’s long enough to almost convince one that ebooks are idiotic compared to physical books. Last night I turned it off and then it turned out that my wife wanted to do some more reading in her book. So I wanted to read and it too forever to boot up. (And that happened twice!) From now on, unless I’m off to work or something, I’m just leaving it sleeping. I played some sudoku on it last night. It’s interesting the way it works, but the LCD touch screen’s insistence to go into power save mode while I’m thinking of the next number is a little annoying as it doesn’t appear to just wake up from one touch. Either that or capacitive touch screens hate me. (I have a bit of trouble with my brother-in-law’s Droid) I haven’t loaded any music into it yet, but I like that it supports reading/music playing simultaneously. That’s why Android is better than iPhone OS! I haven’t yet tapped into their daily reading stuff that they tout on the main Nook site, but I’ll come back in the comments or with another post if it’s worth writing about. It’s nitpicky, I know, but the one thing that ALL iPods and iPhones CAN do is play music and do anything else at the same time. Actually, the old iPhone OS was single tasking. So that should preclude listening to music while reading. Strange, but you’re the one with all the Apple devices, so I stand corrected.